The fifth arthropod of the 2016 Occulto Night season is a beautiful Inachis Io specimen, showing its ventral black surface and introducing you to two great duo performances. Philippe Leonard with his double 16mm live projections – you may have seen him at work already if you went to any Godspeed You! Black Emperor gig lately – and Thisquietarmy with his improvised, cross-genre ambient/noise/shoegaze/doom guitar drone set will present their new collaborative project, while Berlin based Marimba (aka Delmore FX and Paul Jones, and please check Das Andere Selbst label while you’re at it) will derange your senses with improvised and composed melodies, noises, guitar and synth sounds. This is the last Occulto Night of 2016 – you’re warmly invited to join and celebrate with us! More to come in 2017. An opportunity to see in action Philippe Leonard, influenced by the great tradition of North American experimental cinema, whose practice on film (16mm and 35mm) led him to important collaborations, including the contribution to the visuals of Godspeed You! Black Emperor, and the pioneering Thisquietarmy music project. The Canadian duo works in great synergy on the possibility of expanded cinema. An alchemy of cinema and sound, working on the matter and on devices (16mm film projectors/electricity, guitar and pedals) for a journey that explores the possibilities hidden in the image and its serial essence. Montreal-based project active since 2005, pioneering the experimental music scene emerging from Canada. Revolving around improvised guitar drone and by combining textural & structural elements of ambient/noise, electronic/shoegaze, post-punk/krautrock, black/doom metal, thisquietarmy creates an impressive wide range of dynamic soundscapes which oscillates between the beauty of repetitive dreamy minimalism and the heavy suffocation of multi-layered noisescape and industrial beats, as presented in its prolific discography comprising of over 30 releases on more than 20 different labels including Denovali Records, Aurora Borealis and Shelter Press. thisquietarmy has recorded collaborations with Aidan Baker (Nadja), Scott Cortez (loveliescrushing), André Foisy (Locrian) and Labirinto, among others, and has taken part in other projects such as Hypnodrone Ensemble, Destroyalldreamers, Mains de Givre & Parallel Lines. He performed in more than 30 countries in North/South America, Europe & Asia, including appearances at Nemo Digital Arts Biennale (France), Incubate Festival (Netherlands), Le Guess Who (Netherlands), Dunk! Festival (Belgium), Amplifest (Portugal), Zemlika (Latvia). Canadian experimental film-maker, based in Montreal. His artistic practice focuses on still and moving images, through film, photography, performance and installations. His theoretical and aesthetic reflections focus on the complex temporality of still and moving images, the spectral dimension of physical spaces, and expanded documentary practices. Distributed by Light Cone and CFMDC, his work has been showcased in notable international contexts, such as the 16th WRO Media Biennale (Poland), Rotterdam International Film Festival (Netherlands), Anthology Film Archive (New York), Galerie Michel Journiac (Paris), Cineteca di Bologna (Italy), European Media Arts Festival (Germany), O ‘Gallery (Milan), Museo Nitsch (Naples), Struts Gallery (New Brunswick), Annecy International Animated Film Festival (France), Galerie Les Territoires (Montréal), etc. As a cinematographer, he is involved in artistic, documentary and commercial audiovisual projects, using a broad range of cameras and formats: Super 8, 16mm, 35mm, HD, etc. Philippe Leonard emphasizes a mastery of both analog and digital techniques to create moving images. In 2013, he was awarded a residency at the MIT Media Lab to study under the mentorship of the late Harun Farocki. He is a member of the Montreal collective of experimental cinema Double Negative and Millenium Film Workshop in New York City. 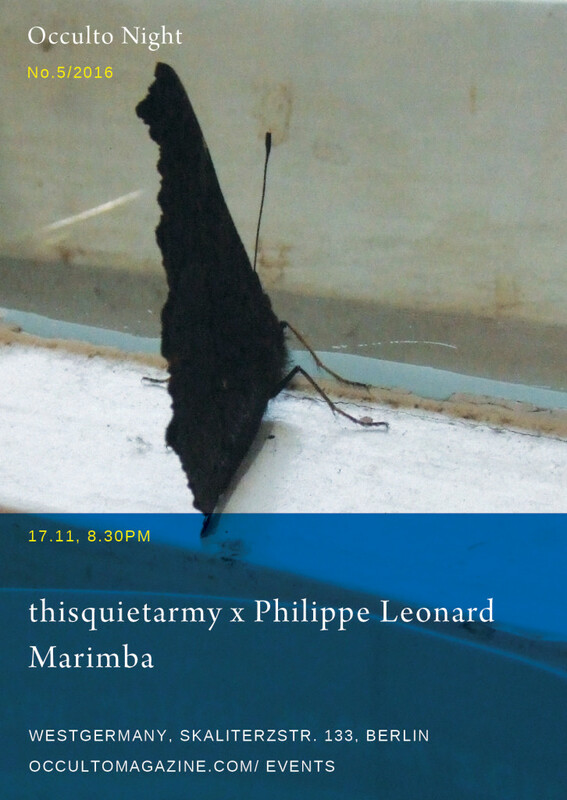 Marimba is an ongoing side project by Paul Jones (Cindytalk, Mothership Convention, Stolen recordings) and Elia Buletti (Delmore fx, Das Andere Selbst). They met in Berlin on 2013 and share since then a multitude of interests and diverse influences from metaphysical bacterium to gate compression. They’re creating instinctive natural sonic forms that evolve through improvisation and derangement of all the senses.